Criada na Itália, por Gianni Versace a grife que leva o sobrenome da família, há décadas dita tendência e conquista os olhares de admiração do seleto grupo de convidados das primeiras filas dos desfiles das semanas de moda. Em seu portfólio constam vestidos que valorizam a silhueta, sapatos femininos ousados, bolsas statement e até perfumes. De corte impecável, as peças são trabalhadas com estampas, bordados e outros detalhamentos luxuosos, ou seja, um verdadeiro investimento! Confira! Versace Yellow Diamond abre com a luminosidade cristalina de cidra diamante, o generoso frescor de um sorvete de pêra envolvidos pelas notas cítricas de bergamota e toques de neroli. A Fragrância: A elegância rara da flor de laranjeira brilha entre a luminosidade da frésia e a transparência natural de flor de lótus. O fundo apresenta a sensualidade da madeira ambarada, o caráter ensolarado e vibrante da madeira de guáiaco e a presença refinada do almíscar. Pura sensualidade, pura transparência, pura luz: mais uma vez uma autêntica joia de rara beleza, Versace Yellow Diamond se revela em um perfume floral fresco e vívido. Uma nova fragrância cativante e sensual. 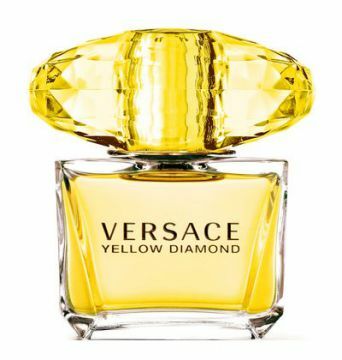 O Frasco: A verdadeira feminilidade, fiel com um charme próprio, em harmonia com o inconfundível glamour Versace Yellow Diamond . Brilhante, puro como a luz do sol, um brilho extraordinário que irradia com uma intensidade de fogo, luminoso, como Diamante: de repente uma fragrância, um encontro de raios de luz. Multicoloured printed silk thong from Versace featuring an elasticated waistband, a ruffle trimming and printed fabric details. Underwear and lingerie must be tried on over your own garments. 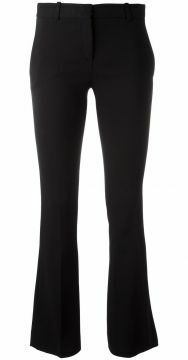 Conjunto duas peças com vestido e lenço para cabeça preto, Versace. Possui decote em V, mangas longas, stretch, comprimento midi e fenda lateral. 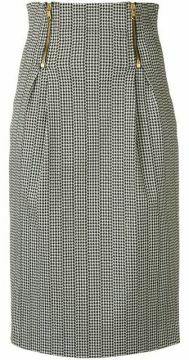 This Italy-crafted black and white cotton blend high rise pencil skirt from Versace features a mid-length, side zip details, a back zip fastening and vichy check print. Perfect for a day to night look. 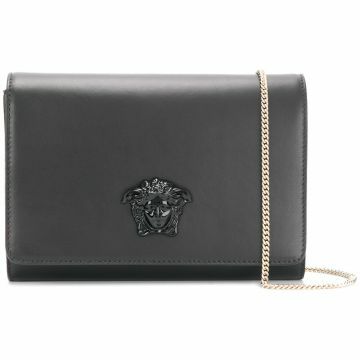 Bolsa transversal Icon pequena preta em couro, Versace. Possui parte superior dobrável com fecho de encaixe, etiqueta em couro, efeito matelassê e compartimento interno. Paying tribute to her late brother, fashion legend and founder of the company, Gianni Versace, Donatella revives archival motifs and house codes. 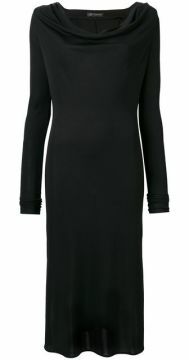 This black one sleeved midi dress from Versace features a branded high neck, a logo tape trim, a rear keyhole detail, a draped design and an asymmetric hem. 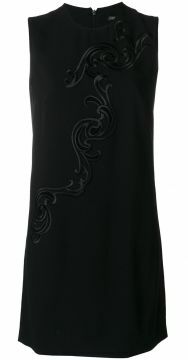 Regata com logo estampado branca e dourada, Versace. Possui decote arredondado, fechamento por botões nos ombros, modelagem sem mangas e logo estampado. 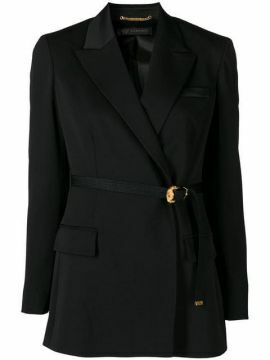 Blazer com cinto preto Versace. Com estilo tubinho, gola aberta, bolsos frontais com lapelas e ombros estruturados. 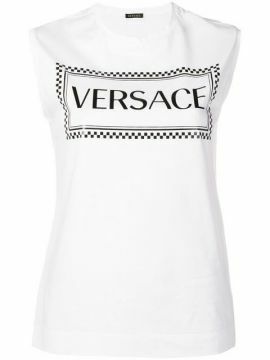 Versace goes beyond utilising the actual brand name to represent their rich Italian heritage and contemporary design ethos through instantly-recognisable house codes. 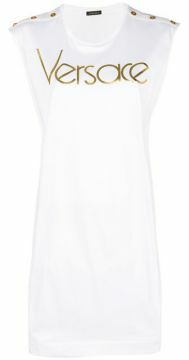 White cotton classic logo T-shirt from Versace featuring a round neck, short sleeves and a loose fit. 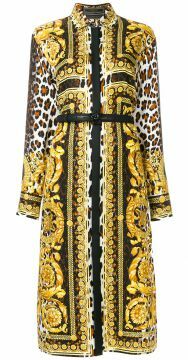 Versace goes beyond utilising their actual designer name to represent their rich Italian heritage and contemporary design ethos. Instantly-recognisable house codes such as the Greek goddess-inspired Medusa head motif have become renowned symbols of the brand. 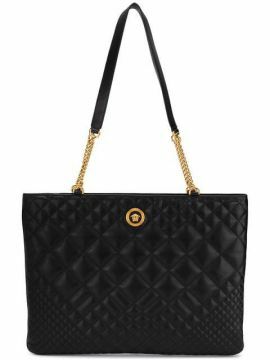 Crafted in Italy from high quality black leather, this oversized quilted shoulder bag from Versace features a Medusa detail, gold-tone hardware, a chain and leather strap, a gold-tone top zip fastening, an internal slip pocket and an internal logo patch. 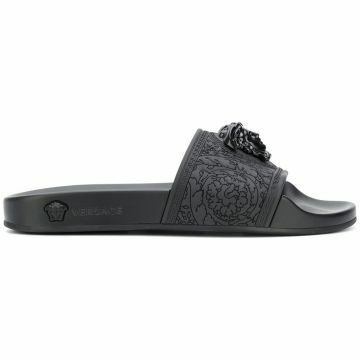 Sandália Medusa de couro preta, Versace. Possui tira traseira, solado com logo e salto baixo. 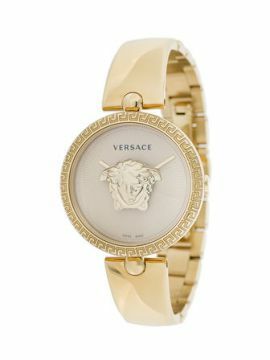 A pillar of luxury Italian fashion since its founding in 1978, Versace is celebrated for their glamorous details and impeccable craftsmanship which carries seamlessly onto their accessory collections. 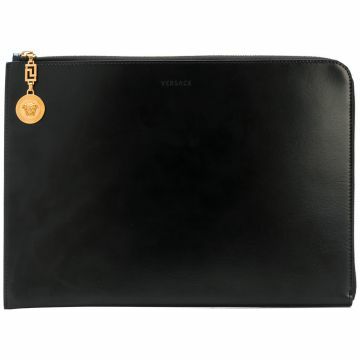 This black leather embellished Icon shoulder bag from Versace features crystal accents, foldover top with twist-lock closure, a Medusa detail, a gold-tone chain shoulder strap, a hanging key fob, a back slip pocket, an internal slip pocket and an internal logo patch. A pillar of luxury Italian fashion since its founding in 1978, Versace is celebrated for their glamorous details and impeccable craftsmanship. 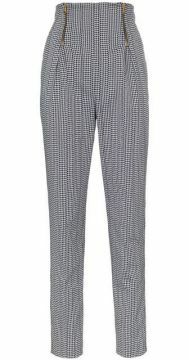 Crafted in Italy, these black and white cotton blend houndstooth printed trousers from Versace feature a high rise waist, side pockets, a concealed rear zip fastening, a straight leg and gold-tone zip details with pleats. 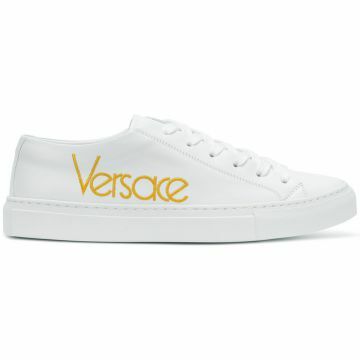 Since its founding in 1978, Versace has been synonymous with luxury fashion. For their Spring/Summer 19 collection, iconic prints and characteristically glamorous designs sit alongside sleek, modern ideas. 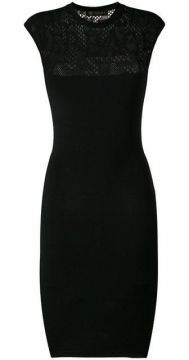 This black fitted midi dress from the collection features a sleeveless design, a fitted silhouette, a round neck and knitted logo pattern. 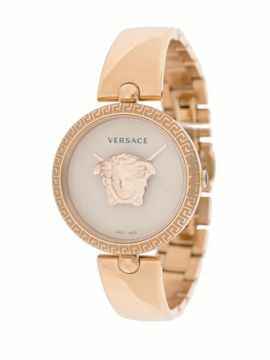 A pillar of luxury Italian fashion since its founding in 1978, Versace is celebrated for their glamorous details and impeccable craftsmanship which carries seamlessly onto their accessory collections. These multicoloured calf leather baroque print sandals from Versace feature an open toe, a double strap, a branded insole and a high stiletto heel. Paying tribute to her late brother, fashion legend and founder of the company, Gianni Versace, Donatella revives archival motifs and house codes. 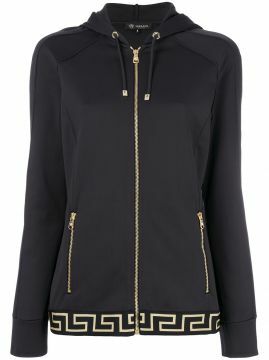 Versace s rich heritage pays a visit to casual, sports-inspired styling. 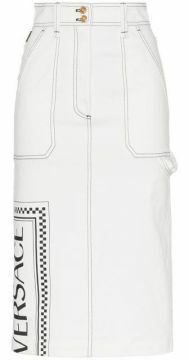 Made from stretch cotton, this white fitted skirt from Versace features a high waist with belt loops, a button and zip fly, diagonal front pockets, two back patch pockets, a back slit at the hem and a rear logo patch. The piece is skillfully finished with a branded print to the front, a contrasting top-stitch and a gold-tone logo plaque to the back. 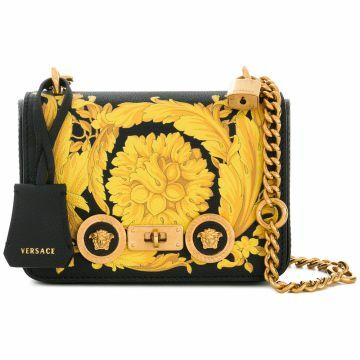 Since its founding in 1978, Versace has been synonymous with luxury fashion. For their Autumn/Winter 18 collection, iconic prints and characteristically glamorous designs sit alongside sleek, modern ideas. 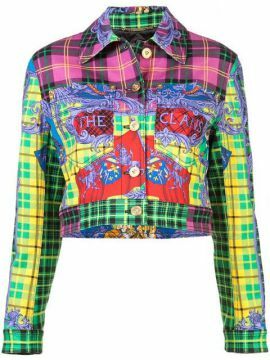 Presented in a vibrant colourway, this cropped tartan jacket from Versace will surely brighten your winter looks. Seamlessly crafted in Italy from soft cotton denim, this sleek jacket features a classic collar, a front button fastening, two chest patch pockets, a head-turning tartan print and a soft silk lining. Relógio analógico Palazzo Empire dourado, Versace. Possui tom dourado e fecho de tarraxa. 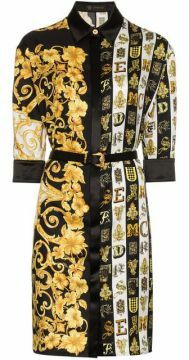 Relógio analógico Palazzo dourado, Versace. Possui tom dourado rose, catraca rotatória e fecho de tarraxa.